During a visit a while back, my friend Helen brought over a tin of Mariage Freres "des Impressionistes" flowery vanilla green tea, and now it is one of our favorites! The tea is light and has a slightly floral flavor to it, with the added warmth of vanilla. It almost tastes sweet by itself. Recently we had my friend Diana and her husband and kids over for dinner, and upon serving this tea after dinner, everyone agreed that it would make a fabulous ice cream as well! So a couple of weeks later when they came to visit again, I set out to turn this delicious tea into an ice cream the night before. 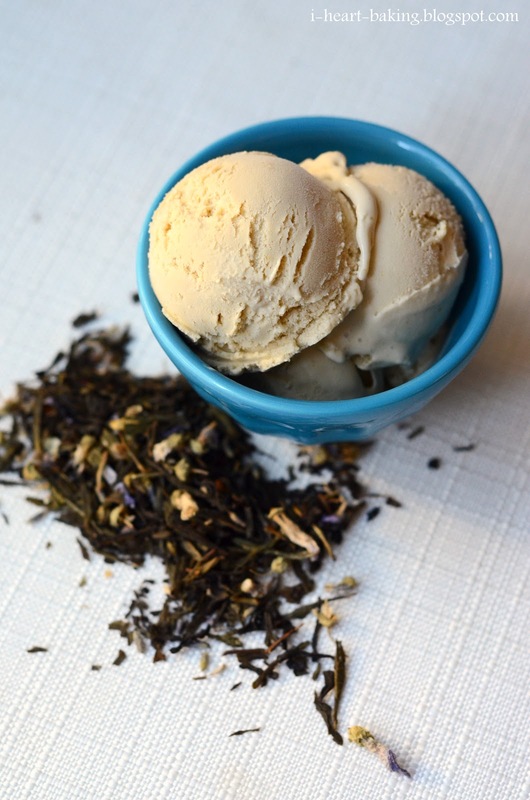 I've used various teas to flavor ice cream before, such as earl grey ice cream and jasmine tea ice cream, so I followed the same concept (based on a combination of Gourmantine's jasmine ice cream recipe and David Lebovitz's green tea ice cream recipe from his book "The Perfect Scoop"). I added the loose leaf tea to hot milk and cream, and let it steep for about an hour. Then I strained it, and pressed on the steeped leaves to get the maximum flavor out of them. After discarding the used leaves, I poured the mixture back into the pot and let it warm on the stove. Then I whisked egg yolks with sugar, tempered the egg yolk mixture with the warm milk/cream mixture, and then poured everything back into the pot. Once the pot was back on the stove, I cooked it over medium heat, stirring constantly, until the mixture thickened into a custard. I let the mixture cool to room temperature, and then let it chill the fridge for a few hours before churning it in my ice cream maker. After it churned for 25-30 minutes it was ready, and I poured the soft ice cream into a container and let it set overnight in the freezer. 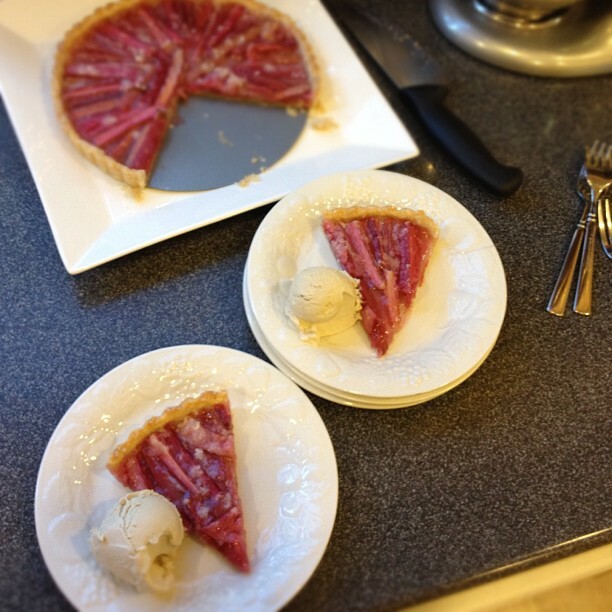 The next day, I found fresh rhubarb at the market, so I decided to make a rhubarb tart to go with the ice cream. The combination of flavors ended up being the perfect marriage of crispy crust, tart rhubarb, and creamy floral ice cream! 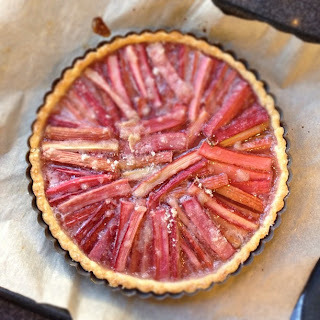 I didn't take any pictures of the tart and ice cream with my camera that night, but I did take pictures with my phone, so my Instagram pictures will have to do! Incidentally, this led to a slight obsession with rhubarb in the coming weeks, which turned into an addiction of making rhubarb tarts! Stay tuned! This sounds delicious! I haven't used my ice cream maker in a while...I will have to take it out again! Thanks for sharing. Check out this link, you been nominated for a blogger award. @Ella Niemela - wow, thank you SO much!!! :) i'm so honored!